Wild: Among the island’s water-based threats, Sarcosuchus excubitor is a lot what you might expect from a giant crocodile: A patient killing machine. It spends much of its days lazily waiting in the water for prey to walk near. That said, it is not opposed to scurrying onto land and pressing the issue when hungry. 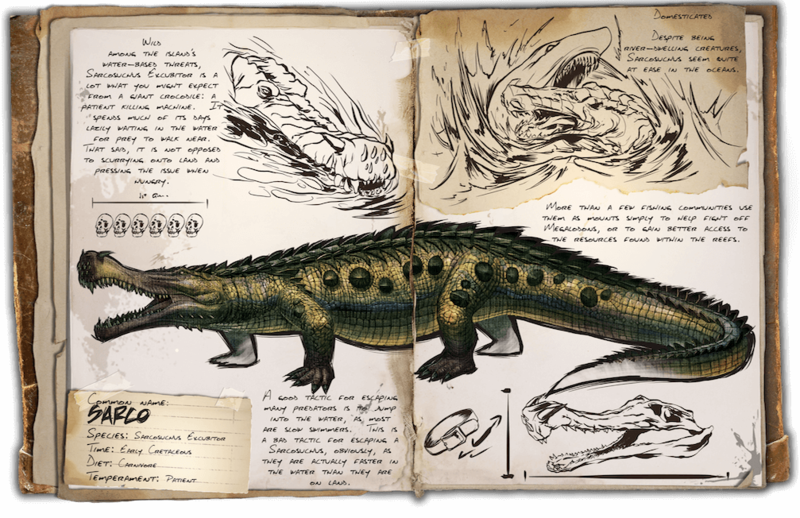 Domesticated: Despite being river-dwelling creatures, Sarcosuchus seem quite at ease in the oceans. More than a few fishing communities use them as mounts simply to help fight off Megalodons, or to gain better access to the resources found within the reefs. Known Information: A good tactic for escaping many predators is to jump into the water, as most are slow swimmers. This is a bad tactic for escaping a Sarcosuchus, obviously, as they are actually faster in the water than they are on land.